Charlotte Vaughn Rainse and Adam Brooks in Rhinoceros. Photo by Peter Zeilinski. BOTTOM LINE: A colorful, cartoonish approach to this absurdist classic. What I admire most about the Theatre of the Absurd is its ability to highlight the ridiculousness of the human condition. Characters who purport to understand their universe are reduced to buffoons as they rely on logic and reason to explain the unexplainable. Pretentiousness works overtime to obscure circular logic and inane reasoning. The harder characters work to demonstrate intelligence, the more foolish they appear. 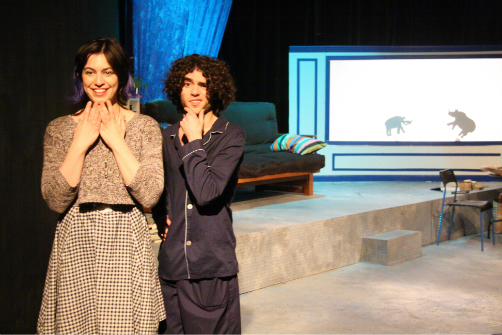 The Onomatopoeia Theatre Company’s energetic production of Rhinoceros derives its hilarity from such foolishness and eagerly places its animated buffoons front and center. As a rhinoceros is spotted in an unnamed French town, a Logician’s (Clinton Powell) response is to futilely pontificate about whether the animal is an African or Asiatic rhinoceros based on how many horns it has, as though this is a relevant and important distinction to hash out in such a scenario. The town is soon overrun with rhinoceroses, and in Act Two, we learn that the townspeople are inexplicably being transformed into them. The only character that avoids this fate is Berenger (Adam G. Brooks), an average man who is constantly berated for his tardiness, laziness and drunkenness. Rhinoceros suggests that anyone who claims to be a valuable member of society will eventually succumb and become part of the very problem destroying that society. Ionesco’s classic play was originally understood to be an allegory for the Nazi takeover of France. The ensemble in this production is lively. Thomas R. Gordon’s direction keeps the action moving at a nice clip for nearly the entire duration. The action slows down a bit in the latter half of Act Two as we watch our second and third human-to-rhino transformation. The first transformation takes its time, which is necessary for the audience to fully grasp what is happening. But once I caught on and accepted the absurd situation, I found myself wishing the action would move along a little faster. Zachary A. Serafin’s set and Al Malonga’s costumes contribute a healthy dose of color to the production, which supports the overly animated acting style that gives it its cartoonish feel. My most significant criticism, however, concerns this cartoonish approach. For an absurdist comedy to be effective, audience members must recognize aspects of themselves in the characters they are watching. By constantly commenting on the foolishness of the characters and allowing them to appear utterly ridiculous, the actors are making them less recognizable as real people, thereby undermining the comedy inherent in the script. By portraying the characters as bumbling fools, the ensemble is unfortunately guiding the production away from the Theatre of the Absurd, and towards the Theatre of the Ridiculous.